Selecting the best nursing school in Indiana can be difficult. To make the process easier first look for a school that supports students towards licensure and beyond. A great way to measure this is through NCLEX-RN "pass rates." 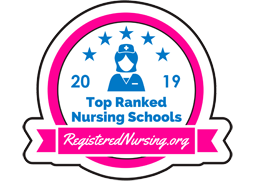 We have ranked the top 20 nursing schools in Indiana by analyzing current and historical NCLEX-RN "pass rates", meaning the percentage of graduates who pass the exam, out of the 49 RN programs in the state. Programs reviewed include schools that offer an Associate in Nursing (ADN/ASN), BSN, or Direct-Entry MSN Degree. 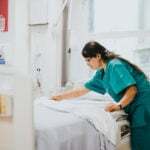 Indiana is strongly trending toward a higher level of care for their patients and is calling on the nursing industry to help with their plight. There is a need for nurses that possess a degree greater or equivalent to a Bachelor's of Science in Nursing (BSN). The state predicts an estimated increase of 2,200 nursing jobs annually; these positions offer a higher salary to candidates that possess a BSN or greater degree. 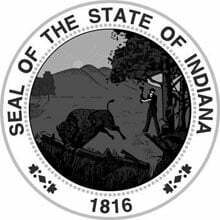 Indiana currently has approximately 49% of their nurses with a BSN, by being part of that movement the state will be well on its way to successfully reaching their goal. Becoming a nurse is an academic path that can be tough, and in recent years, there are more paths to that career goal than ever before. The ADN or Associate's Degree in Nursing is one such way for students to begin their post-secondary pathway without too much time or dollar investment. With a program length that is generally 2 years, and offerings at many vocational, technical or community colleges throughout the state, an ADN is an accessible and affordable option for students interested in RN licensure. At present, more than 25 technical and community colleges offer the Associate's Degree in Nursing to dedicated students. With high NCLEX pass-rates, many students choose the two-year degree as their first stop in lifelong learning. With all the offerings on a college campus, how do you make sure you pick the right ADN program for your learning? Colleges advertise success metrics, which makes it easier to do an apples-to-apples comparison on factors like accreditation, licensing and program outcomes. Read here for more information. There are all manner of rankings that compare aspects of one college to another; however, 'accreditation' means that there is a standard of education in place. A degree from one institution means the same thing as a degree from another institution, giving both students and employers confidence. The North Central Association of Colleges and Schools (NCACS) accredits Indiana's colleges. Nursing programs are subject to both the overarching accreditation process as well as industry-specific accreditation via the Accreditation Commission for Education in Nursing (ACEN) or the American Association of Colleges of Nursing (CCNE). The ADN program that you decide upon should definitely enable you to sit the state's NCLEX-RN exam for licensure once you have your diploma. With a passing grade on your licensure testing, you'll be eligible to pay applicable annual fees and receive your RN license. In order to make a transparent process from start to end, the state Board of Nursing ensures that nursing programs have the necessary components and practice to makes sure licensure is achievable for diligent students. Statistics report that over 80% of students at the college level received satisfactory grades on the RN exam. College tuition for public institutions throughout the state are basically on par with one another - it's in the best interest of the state to offer an affordable, accessible pathway to students who will become part of an educated and technically savvy workforce. While there is some variance across the state, the cost of tuition at a sample school has been outlined for you. Ancilla College offers tuition to nursing students for approximately $8,000 per semester for 11 - 17 credit hours per semester. This does not include housing or food costs. Nursing students have additional fees to pay for lab classes, testing, insurance for malpractice, uniforms and sundry other expenses. ADN graduates are a sound economic addition to their communities in both rural and urban America. The programs' accessibility ensures that education toward a nursing licensure is achievable for all, and ADN grads are a significant pathway to overcoming shortages in healthcare. Indiana Licensed Practical Nurses (LPNs) who are interested in furthering their education have the option of enrolling in an LPN to RN program. These programs prepare practical nurses to earn a registered nursing degree and to take and pass the NCLEX-RN examination. The most basic pathway to registered nursing is via the LPN to ADN program. Students who choose this route are awarded an associate's degree in nursing after a few semesters of transitional coursework. Ancilla College offers an LPN to RN that culminates in an ADN degree and can be completed in 2 semesters. For those looking for a bachelor's degree, the LPN to BSN pathway is an excellent choice. Indiana State University offers an LPN to BSN program that has both part-time and full-time attendance options and is completed online with local clinical experiences. Interested in a more advanced nursing degree? Many high school and ADN graduates hit the lecture hall to earn their BSN or Bachelor of Science in Nursing. Usually consisting of 4 years of study, BSN degrees are becoming increasingly common. Class sizes can be large, and BSN degrees are undoubtedly more expensive, however students find that they are a value-added option as a BSN increases mobility and career options once new nurses hit the floor. Just like ADN graduates, however, BSN students need to become licensed RNs through the countrywide NCLEX procedure. BSN students are immersed in an atmosphere of technical skills and compassion for patients that helps them form ethical decision-making on the job. Graduates strive for high-quality collaborative environments and try to advance public health policy for everyone. Purdue University is home to a renowned BSN program. Proud to shape the largest demographic of healthcare workers in the country, Purdue faculty empowers nurses to be leaders in health management and communication. BSN graduates work from neonatal intensive care to gerontology throughout the world, in hospitals, clinics, and communities. BSN programs average about 4 years in length, depending on the number of credit hours that a student might engage in from semester to semester. The course load is designed to provide an intensive yet balanced approach to nurse education, with time allotted for courses, coursework, clinicals, reflection and personal time. Accelerated programs, summer sessions, and bridge programs for returning students can shorten BSN length. A university education is often the first investment of capital in a student's future and the expense can be daunting. Luckily, jobs in nursing are on the rise. Virtually all universities publish their tuition and living rates annually to help students plan how to meet their financial commitment for education every year. Students at the University of St. Francis - Ft. Wayne can expect to pay about $28,500 per year in tuition; books, materials, room and board, as well as fees aren't included in this price. All students should apply for financial aid on an ongoing basis to help meet their academic and financial goals. BSN program 'pros' outweigh the 'cons' when it comes to the quality and length of the program. Offered in more urban environments, students are exposed to a range of diversity and care practice that they might otherwise miss. Class sizes can be large in first year, but faculty quality and outreach shapes student ethics and values from the outset of their education. Many universities are connected with major hospital systems, which results in a robust series of clinical placements. Want to become a leader in mental health, pediatrics or oncology? Consider advancing your degree to pursue graduate level studies and an Master's of Science in Nursing (MSN) diploma. MSN degree holders have better pay options, and a lot of leadership responsibility in their organization or in the community. At the MSN degree level, you will also have options to teach nursing practice and theory to the next generation of RNs. Many courses are offered in a hybrid online/on-campus format that respects the commitments that established nurses often have to their professional and personal lives. Taken over a 1-2 year span of time, nurses will develop a plan for specialty. On average, requirements to graduate are about 50 hours of classroom time, offset with several hundred hours of clinical placement. 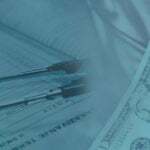 In an effort to promote the value of advanced practice nursing care, Indiana has some of the most comprehensive MSN fees. For example, the University of Southern Indiana has MSN fees that are approximately $450 per credit hour for in-state student; however, there are additional fees for university services, parking, and administration. Accelerated BSN programs or bridged RN to MSN programs are offered across the state in more than a dozen different locations. These programs allow nurses to obtain their degrees at a faster pace, some in as little as 12 to 18 months. Although these programs are shorter in duration they are also quite intensive in delivery and require students to attend full-time, while maintaining clinical requirements. When looking at these programs and the overall cost, you should make note of any entrance requirements that might alter the tuition, and factor in housing costs if applicable. Prerequisites for each program vary a little and must be meet prior to entrance into the program. Anderson University is an important part of the Anderson community. Graduating with a BSN or MSN degree in hand means that nursing graduates are welcomed into the community's professional health care circles. Visit the Anderson University nursing website to learn more. The University of Southern Indiana in Evansville, Indiana is home to some of the most widely acclaimed nursing curriculum in the state. With BSN and MSN pathways to guide nursing students to their goals, USI graduates are caring advocates of individuals, families and communities. Get all the program details by visiting the University of Southern Indiana website. Located in Gary, Indiana, the Indiana University - Northwest campus is home to a renowned nursing program. BSN and MSN graduates are hailed as critical thinkers and strong advocates of individual, family and community health. Learn more by visiting the Indiana University Northwest nursing website. Located northwest of Indianapolis, Purdue University is situated in the community of West Lafayette. Renowned for its college of nursing programs, students can pursue a bridge, BSN, or MSN program through the institution. Follow the link to learn more about the Purdue University nursing program. Ivy Tech Community College's Terre Haute campus is located in the western portion of the state. ITCC nursing students focus on demonstrating mastery of the science and care portions of effective nursing practice. Get all the program details by visiting the Ivy Tech Community College - Terre Haute website. Valparaiso University is located in the community of Valparaiso, Indiana. A medium-sized city, Valparaiso is proud to be home to nursing graduates that are BSN and MSN degree holders. 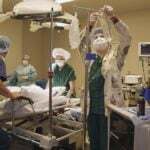 Patients near and far benefit from the nursing skills that graduates learn at Valparaiso. Get all the program details by visiting the Valparaiso University website. Indiana University's campus in Kokomo offers a BSN program designed to give students hands-on experience. With a 96% NCLEX-RN exam first-time pass rate and a 100% employment rate for BSN students, it's easy to see why Indiana University is a popular choice. Visit the Indiana University Kokomo nursing website to learn more. Lafayette's St. Elizabeth School of Nursing offers a diploma/Bachelor of Science program in conjunction with the University of St. Francis. The concept-based curriculum teaches students to creatively problem-solve to provide safe, quality care to patients. 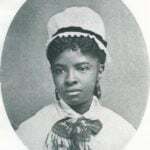 Visit the St. Elizabeth School of Nursing nursing website to learn more. Bethel College in Mishawaka lies on the Joseph River and is acclaimed for its nursing program. With caring faculty, graduates develop into skilled nurses who provide intuitive and evidence-based assessment for a diverse array of patients. Follow the link to learn more about the Bethel College nursing program. University of St Francis - Ft. Wayne is an integral part of the Fort Wayne community. With leading-edge faculty to guide them, students use innovative learning technologies as well as valuable theory and practice to hone their skillset. Check out the official University of St Francis - Ft. Wayne nursing program. Purdue University Northwest's baccalaureate degree program provides students with an excellent evidence-based nursing education. The program boasts a 100% completion rate, as well as a 98% first-time NCLEX-RN exam pass rate. Learn more by visiting the Purdue University Northwest nursing website. Goshen College boasts the oldest BSN program in Indiana, and it's also one of the best. Since 1950, Goshen College has been turning out stellar nursing grads, and a recent poll shows that 100% of nursing alumni are satisfied with the program. Visit the Goshen College nursing website to learn more. Ivy Tech Community College - Evansville's nursing students are widely sought after and professionally capable. With the theory and practical skills that lead them directly into the nursing profession, ITCC nursing graduates are knowledgeable providers of nursing care. Visit the Ivy Tech Community College - Evansville nursing website to learn more. Ivy Tech Community College - Bloomington is located southwest of Indianapolis, and provides many regional communities with excellent nurses. ITCC graduates are prepared for the challenges of today's healthcare environment. Follow the link to learn more about the Ivy Tech Community College - Bloomington nursing program. Indiana University - South Bend's Vera Z. Dwyer School of Nursing offers a BSN program for those who wish to become nursing generalists. The curriculum emphasizes critical thinking and culturally competent care. Visit the Indiana University - South Bend nursing website to learn more. Located in Muncie, Indiana, Ball State University nursing educators use innovative simulations, lots of interpersonal time and mentorship opportunities to ensure that students graduate with excellence and enter into the ranks of professional nursing. Follow the link to learn more about the Ball State University nursing program. Western Governors University - Indiana is located in the city of Indianapolis. Graduates with a BSN or MSN degree use critical thinking to evaluate and provide safe and empathic patient-centered healthcare solutions. Check out the official Western Governors University - Indiana nursing program. Nestled in Marion, Indiana, Indiana Wesleyan University helps nursing students find and pursue their life's vocation through their BSN and MSN degree programs. Wesleyan also offers bridge programs for RNs who wish to further their academic goals. Follow the link to learn more about the Indiana Wesleyan University nursing program. 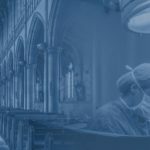 Notre Dame's Saint Mary's College prepares nursing students through its Bachelor of Science in Nursing degree program. With study abroad opportunities and just 8 students in clinical rotations, Saint Mary's College is committed to providing a unique nursing experience for its students. Get all the program details by visiting the St. Mary's College website. Indiana University-Purdue University - Indianapolis (IUPUI) campus is part of a strong network of nursing education. BSN and MSN graduates of IUPUI are committed to using effective communication and advocacy skills to meet both patient and medical team needs. Check out the official Indiana University - Purdue University - Indianapolis nursing program.